"Artists need to make great art, and in order to do that they must find truth -- truth in social issues, and in political issues." Thus speaks Michael Franti, one of the most dedicated and sentient musicians in the business. At a time in American history when the nation is both politically polarized and incredibly unaware of the reality underlying current events, Franti seeks and spreads truth. But who's listening? The lack of mainstream success has not hindered Franti at all. In fact, it allows him a great degree of creative freedom -- freedom from following popular trends, freedom from expectations or demands to "sell more records" or "get with what's hot," and freedom to speak honestly to the world through music. The message is there; making sure it's heard is the challenge. "Music deals with emotions, it goes straight to the heart," Franti notes. "In a way, it is like food, we can do it together and share those moments. When we are involved in the sharing of food and music, we don't worry about our differences." Franti's messages have always been strong, and over the years he has worked on making the delivery of those messages palatable and accessible without losing their meaning. "The Beatnigs were playing punk-industrial music," he recalls, regarding his first band from the late 1980s, "with Beat poetry as the lyrics." Moving on to the Disposable Heroes of Hiphoprisy in 1992, Franti found his voice with a hard rap style that was profound and intimidating. Focusing almost exclusively on social issues, the band's efforts just didn't fit into the commercial rap/hip-hop scene. "Even though the overall social consciousness has grown since 9/11 and Katrina, hip-hop is still mostly 'party music,'" he says. "There's not a lot of conscience to be found in the mainstream. But there is in the underground scene." Finding a modicum of public recognition and marginal success with a consortium of musicians called Spearhead, Franti's style has gradually evolved. By turning his focus inward, he developed a very personal writing mode that gave a strong but appealing voice to his ideas and thoughts. And the music began to change. Moving away from beat-boxing and rhythm-heavy tracking, Franti began exploring different styles of instrumentation. "When working on new music, I ask myself, 'What best serves the words in the song?' By trying a number of different things, I find the best way to support the words." He also began to sing -- beautifully. Franti's influences run deep and wide, from the reggae of Bob Marley, to the mellow acoustic sounds of Bill Withers and the soulful emotion of Marvin Gaye, to hard rock. On his most recent release, Yell Fire, Franti worked closely with reggae icons Sly Dunbar and Robbie Shakespeare to wrap many of his observations in a very Jamaican cloak, possibly as an homage to his hero, Bob Marley. Yell Fire is an incredibly emotional album, borne of an incredibly emotional experience. 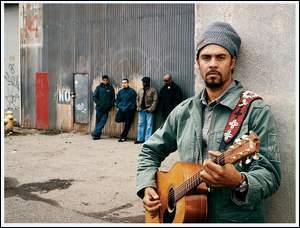 In 2004, Franti spent some time in Iraq and the West Bank, filming his experiences and people's reactions as he brought a guitar, not a gun, into their lives. It was this adventure that inspired the songs on Yell Fire. The resulting DVD, I Know I'm Not Alone, captures the unique interactions between Franti and both the American servicemen and the people of the Middle East as they are confronted with something other than violence and intimidation. "The Iraqis want to make their own decisions, but they define things on different terms than America does. In order to solve these problems, we cannot try to convince others that 'I'm right, you're wrong,'" he says. "We have to listen, look for good ideas and understand each other's needs." Hopefully, people are starting to listen.